Reeves DiVenere Wright is pleased to offer estate planning services for clients of all ages and in all stages of life. Whether you need Healthcare Powers of Attorney, Durable Powers of Attorneys Wills or Trusts the attorneys and staff at Reeves DiVenere Wright will work with you to develop an estate plan that fits your and your family’s needs. Do I need to hire an attorney or can I use a form I found on the internet? There are many forms that can be found on the internet. Some may comply with North Carolina State Laws, but others may not. 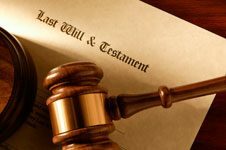 The only way to be sure that your documents are valid is to consult with a licensed North Carolina attorney who is experienced and knowledgeable in the area of estate planning. No estate plan is ever the same and each presents unique issues and sensitivities and therefore must be evaluated on a case to case basis. Please call our office and we will speak with you regarding potential fees regarding your specific needs. Will my estate have to pay federal or state taxes? Each case must be evaluated individually. Reeves DiVenere Wright will work in conjunction with tax professionals of your choosing to ensure that you maximize the value of your estate. Can your firm assist me in carrying out my duties as an Executor or Personal Administrator? Yes, we are pleased to offer assistance in probate proceedings. We will guide you through every aspect of the process and ensure that you are properly performing your duties. You can expect the attorneys and staff to take your calls, answer your questions, and keep you informed about your case. Reeves DiVenere Wright pride themselves upon personal and meaningful interaction with their clients throughout the entire course of representation. There is generally an initial consultation fee, depending on the individual circumstances.